I’ve been waiting for this red LED to light for quite some time.. In total almost 390000 sensor records were recorded to the SD card. With 42 eeprom page writes per cycle (and inefficient Ascii character encoding via pString) the 4k AT24C32 on the $2 RTC board was filled almost 9300 times in this test. This is approximately the same amount of data we would process from one year of operation at a 1.5 minute sample interval…and the design supports six batteries: three more than were used in this test. This opens up two possible directions for the physical build: I can reduce the housing size so that it only accommodates three batteries, or I can keep the current dimensions, with some reasonable faith that even if we get some pretty bad cells, the loggers will still last for a year. For now, I think I will take what’s behind curtain number two because another interesting event happened this last weekend…. At least we know the ABS to PVC solvent weld is tight! I set up one of the new drip sensors with Duracell batteries straight from the package, and I left it under the rain gutter down-spout to give it something to record from time to time. A few days later I returned to find the housing bowed out from internal pressure, and found upon opening that one of the batteries had leaked quite badly. 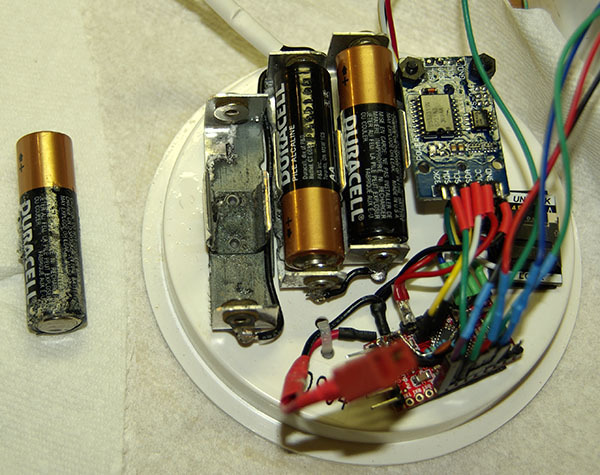 I think the electrolyte in alkaline batteries is potassium hydroxide, and as you can see it corroded the aluminum battery holder significantly. 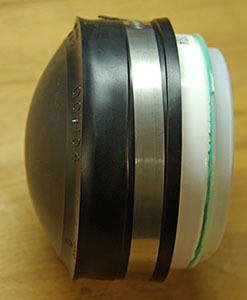 The PVC of the housing was unaffected, and the excess fluid simply pooled in the bottom of the rubber cap. Fortunately the divider that monitors battery voltage put the Arduino to sleep as soon as the failing cell brought the supply below the 3.4 volts required by the regulator on the Pro Mini clone used in this build. 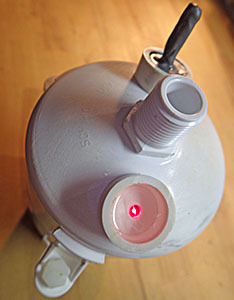 This occurred within one day of the start of the unit, and the only electronic component to expire was the ADXL345 accelerometer, which probably suffered from too much physical strain on its solder joints, as it was welded to the ABS cap which was strongly convex before I opened the clamp. This entry was posted in Reducing power consumption on August 14, 2014 by edmallon.